Vettel was runner-up, 17.1 seconds behind, and surviving a late collision with Hamilton's team mate Valtteri Bottas who also banged bodywork with Red Bull's Australian Daniel Ricciardo. The victory was Hamilton's record sixth in Hungary, fifth of the season and 67th of his career. In a race effectively decided by Saturday's wet qualifying, when Mercedes locked out the front row of the grid against expectation, Hamilton was never challenged. "We came here knowing Ferrari would be really quick this weekend so to come out with these points, we'll definitely take it as a bonus," said Hamilton in a pitlane interview after embracing team members. "I'm really happy with how strong it's come in the last couple of races. We've got to come strong in the next half," added the 33-year-old, who won in Germany from 14th place on the grid a weekend earlier. After 12 races, Hamilton has 213 points to Vettel's 189. "We were out of position. I think we could have gone with Lewis today with the race pace," said Vettel. "P2 is not really what we wanted this weekend but I think it was the maximum today." 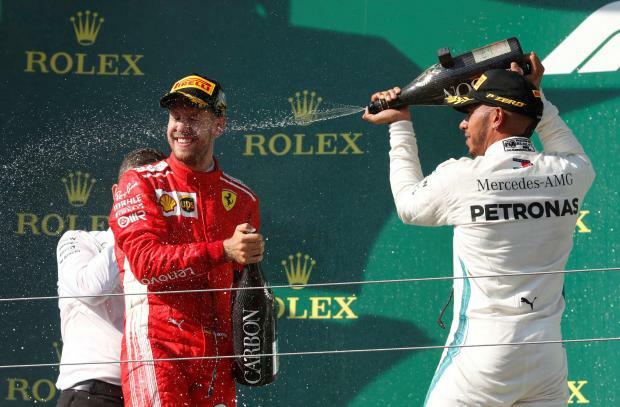 Raikkonen, without water during the race after Ferrari forgot to connect the bottle, made two stops and agreed third -- his fifth successive podium finish -- was the best he could have hoped for in the circumstances. "We caught up with Bottas after the first stop but there was no chance to overtake. So our option was to stop again and try again. At least we got one place back but far from ideal," said the Finn. "I think we had pretty good speed today. But what can you do? Sometimes it's like that, but you take the points and go on to the next one." "We pay multi-millions of pounds for these engines and for first class, or state-of-the-art, product and you can see it's quite clearly some way below that," said Horner.